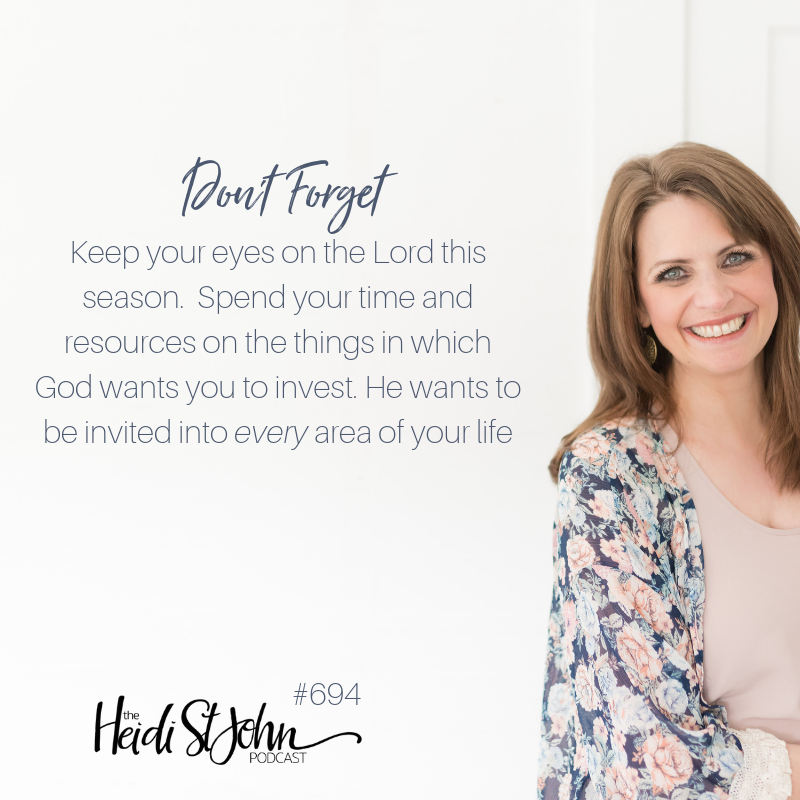 It’s easy to be distracted in December, but I’m encouraging you to keep your eyes on the Lord this season. Spend your time and resources on the things in which God wants you to invest. He wants to be invited into every area of your life, even the little things! Hey everybody. This is Heidi St. John. Welcome to the podcast. Today is Wednesday, November 28th. I hope you guys had a fantastic Thanksgiving! As you may have noticed, I took a couple of podcast days off and we replayed some from the archives. I hope you guys were blessed! Today we’re going to pick it up and talk a little bit about what it means to be in search of joy. We are living in a culture right now that is really struggling with this, partly because we’re so self-centered. But God, in His word, says “get your eyes off yourself and keep your eyes on Me”. If that’s you today, and you’re in search of joy, stick around – I think you’re going to be encouraged! All right, so it’s Wednesday here at the podcast, which means that we are focusing on the study from Momstrong International. 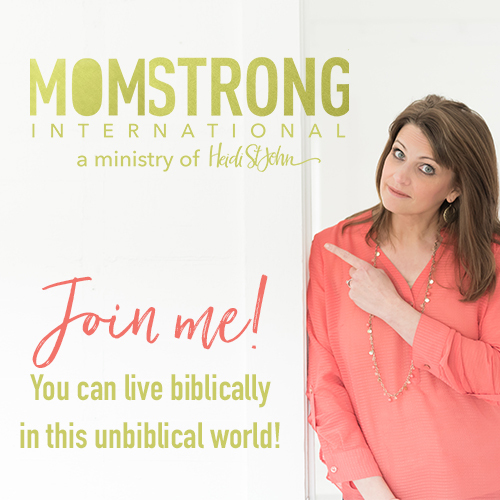 And I’ve got to tell you guys – I am so excited about what God is doing through the Women’s Bible Studies that we are doing at Momstrong International! If you are not a member over there yet, can I just encourage you to do that? We have an entire team now that’s working on that Bible study with me. It takes about seven of us to crank that out every week and we’re changing it up just a little bit. I think you guys are going to absolutely love the direction that it’s going. And let me tell you – the heart behind all of this is very simple: God says in His word that as we walk in right relationship with Him – He is the one who leads and directs and guides our path. So often what I’m noticing in this generation of mothers, and even in grandmothers, is that we are not walking every day in relationship with the Lord. And the reason that we’re not doing it is because we kind of go “you know what we got this, we got this”. And so today I thought I’m going to read a little bit. The next study, by the way, the December study, which is going to start really quick – so this is a great time for you guys to jump in! The next series of studies is going to be called In Search of Joy, and we’re going to be talking about what it means to have joy and how we find joy. Obviously, there’s joy in the birth of Christ. There’s joy in what God has done for us – but we want that joy that the Bible talks about. That inexpressible joy. What would happen, women and men, if we experienced a joy that was so deep – that we couldn’t even put it into words? Peter tells us that we can, and when we do it’s because we’ve attained the salvation of our souls. It’s the outcome of our faith according to 1 Peter 1:8-9. And so we’re going to be talking about this undeniable longing that we all have for contentment, this unquenchable search for satisfaction. Like that song goes “I can’t get no satisfaction”. This is sort of the theme of this generation of our culture and obviously, things haven’t changed since that song was written all those years ago. So we’re going to spend December talking about what it means to have joy, to be in search of joy, and I know it’s going to change your life. I want to encourage you to join us! You can become a member – first thing to do is to become a member of the free Scripture Writing Community over there. Every single month we have printables for you and copywork for your children. I’m telling you men and women, a few minutes in the word of God every day will change your life! It will change your life. Before I read out of Psalm 106, which is the direction I’m going to take today’s podcast, I want to just let you know something that my friend Michael Farris posted on his Facebook page. For those of you who aren’t familiar with Mike Farris – he was the president of the HSLDA (the HomeSchool Legal Defense Association). He is also a dear friend of mine. I have tremendous respect for him. Emergency notice to Loudoun County Virginia homeschoolers. The Loudoun County School Board is preparing to vote to lobby to change the religious exemption law. This “amendment” is a de facto repeal of the religious exemption. Currently the law gives homeschoolers two paths. First: You can use the state’s homeschool law that has educational requirements testing and other demands. Second: you can gain recognition that you are religiously exempt. It’s important to note that private religious schools are not regulated in Virginia. It’s important to note that private religious schools are not regulated in Virginia. So religious homeschools are treated with parody. The proposal would change this. It would say that you can be exempt but only through the homeschool regulatory path. Many would not qualify. I would not have qualified even though my wife and I are more than credentialed. I would, as a matter of conscience, refuse to comply with an approval requirement. This is the same thing the Baptist pastors did in Virginia when the state demanded approval authority do not believe the emails that are going out saying this is not a repeal. They did not appear to know how to read the statute. Please turn out in force. I want to encourage you if you’re not following this story – you can go to HSLDA and find out more information. But I want to encourage you, like I always do, to please be aware of what’s happening around you. Be aware of what’s going on in your community particularly when it comes to your freedoms and what’s going on to kind of squelch the voice of Christians in the United States right now. Certainly this is happening in Canada with an incredible show of force coming out from the far liberal progressives in Canada. And we want to keep our brothers and sisters there in prayer. I was reading this morning with my husband Psalm 106. I’ve been going through the Bible every year. I try to read through the Bible – sometimes I make it all the way through, and sometimes I don’t – but I read Psalm 106 this morning and it’s encouraged me as I’m getting ready to write a new book. I just finished Prayers for the Battlefield. If you guys haven’t picked that up yet I want to encourage you to do that. And a brand new book that I’ve finished several months ago will come out in March called Bible Promises for Moms. And I’m working on just starting a 365 day devotional. It’s a huge project as you guys can imagine, as I’m taking it on with a little bit of fear and trembling, and going before the Lord. This morning I was reading out of Psalm 106 and I was so encouraged by the message that the Lord gave me that I thought – you know, I’m going to share it with the podcast this morning. 2 Who can list the glorious miracles of the Lord? come near and rescue me. 5 Let me share in the prosperity of Your chosen ones. let me praise You with those who are Your heritage. 6 Like our ancestors, we have sinned. We have done wrong! We have acted wickedly! 9 He commanded the Red Sea to dry up. He led Israel across the sea as if it were a desert. and redeemed them from their foes. 12 Then His people believed His promises. Then they sang His praise. 13 Yet how quickly they forgot what He had done! They wouldn’t wait for his counsel! testing God’s patience in that dry wasteland. but he sent a plague along with it. Lord as we talk about this Psalm for just a few minutes this morning, Father I pray that you would just speak through me. Lord, we have so much to be thankful for. Thankful Father, for the gift of Your Son. Thankful that we don’t have to fear anything on this earth Lord, that we know that ultimately – our home is in Heaven, that we are just passing through. So Lord, I pray today, as we consider all the things that are happening around us, as we consider our parenting, as we consider our testimony before other people, Lord I pray that You will just show us what it means – to have that joy inexpressible that comes from walking in right relationship with you. Father, I pray that our hearts to be burdened to be in Your Word, and to talk to people around us about Your love. Lord I pray that we wouldn’t forget all the things that you’ve done for us. Draws to yourself father that we might teach our children what it means to walk in right relationship with you, by doing it first. In Jesus name amen. So for just a couple of minutes I want to focus on this idea of not forgetting what the Lord has done because so quickly we forget. We’re like the Israelites, right? I’m often telling people I like to think that I’m not like the Israelites. I like to think that if I was at the Red Sea and I saw God part the Red Sea. Now the Red Sea, for those who have never been there, the Red Sea is like an ocean. You have to imagine this massive body of water. I’ve heard some people who try to refute what happened there say “oh it was just a creek and so it was easy for them to walk”. Oh no no no. This is a sea and God did an amazing work for them. Why? Because He wants to show them how much He loves them. He defends the honor of His name. He wants to demonstrate His power and so in a demonstration of His power, the Bible records that He commanded the Red Sea to dry up. This is the God that we serve the God who parted the Red Sea, who spoke and the world came into being, who spread the Heavens like a canopy. I watched last year as the Lord of Heaven’s armies commanded a lame boy to walk again. The Bible says that He led Israel across the sea as if it were a desert. He rescued them from their enemies. He redeemed them from their foes. Right in front of the Israelites, the water returned behind them according to God’s Word and covered up their enemies. The Bible says that not one of them survived. And as you can imagine in the wake of that the people believed His promises. They sang is praise! God’s been convicting me of something in my own life and I know that I’m not alone in this. I think that we live, many, many of us – in a state of reactive Christianity. We react to things that happen on the news. We hit our knees in prayer when there’s a shooting or an illness or an accident or a disease that infects the body of someone that we love. But in verse 13, the Bible says how quickly they forgot what He had done. And when they forgot what He had done – this is what it looked like, this is how it manifested in the lives of those people who had just seen God do an amazing work. I like to think, like I said, I am not like the Israelites. Like I would never forget if I saw God part the Red Sea in front of me. But do you know what men and women? According to what people have done for millennia, I probably would forget if I didn’t walk every day with the Lord. This is the first thing that the Bible records happens when God’s people forget what He had done. The first thing that happens is that they won’t wait for his counsel. I want you to think with me for just a minute about decisions that are needing to be made in your life right now. Are you waiting for the counsel of the Lord? We live in a culture of “instant”, right? We love us some Amazon Prime. We love us some instant. I bought something the other day for Christmas and I noticed that it was on back order and it wouldn’t be here until around the 20th of December – and I was like – wait a second, it’s the 21st of November… I should get it in three days! And I started looking for another retailer! I got to thinking why am I in such a hurry? Because that’s how we are. And unfortunately that spills over oftentimes into our walk with the Lord, and those decisions that we need to make – we neglect to wait for the counsel of the Lord. If you read the books of 1st and 2nd Chronicles you’ll see that this was a pattern in the lives of the Kings there. They didn’t want to wait for God’s counsel they wanted to just go ahead and do it. This is a sign that we have forgotten what God has done. That we have forgotten who we serve. That we forgot that we serve the Lord of Heaven’s armies and we are here at His pleasure. The Bible says that we make our plans but the Lord directs our steps. So they forgot to wait for His counsel. And then after that, the Bible says that in the wilderness – now there in the wilderness right? They’ve forgotten what the Lord has done. It’s manifested itself because they won’t wait for His counsel. We want to go ahead and make that decision, we want to buy that new car. I will demonstrate a terrific lack of self-control in my life when my when my spirit is not governed by the Holy Spirit. When I’m not listening. Can you guys relate? And then after we’ve done it for a couple of months and our kids are burned out and we’re burned out and we’re out of patience and probably our budgets drained dry – then we come before the Lord. But what would have happened if we would have gone before Him first in everything? So now we find the Israelites in the wilderness and the Bible says that in the wilderness their desires ran wild. I thought about my own desires and my own struggle with my flesh. I’d be lying to you guys if I said I didn’t struggle with my flesh every day of my life. I told the women at a conference I was at recently that I noticed something in my life many years ago in my struggle to walk every day before the Lord. And my struggles pretty simple see if you can relate: I have to choose every day to open up my Bible. I have to make a conscious choice. And you know what happens to me so often? The first thing I want to do in the morning is just make my list of things that needs to get done. I got to put something in the crockpot. I got to get the clothes from the wash machine into the dryer. I got to make sure my kids are starting their schoolwork, and that I’ve written my notes for the podcast, and I’ve contacted my editor, and the day seems to just press – and all of these things that need to be done and it can so easily drown out that still, small voice of the Holy Spirit who says: Hey Heidi, spend time with me. Let me give you counsel. Let me give your spirit counsel. God wants to do that and when we don’t do that our desires run wild just like the Israelites. And that desire to get ahead or that desire to purchase that car or whatever it is – we end up in the wilderness. Have you guys ever been in a dry wasteland in your life? And you sat back and you wondered how did we get here? Well, I think oftentimes we can trace it back to our own unwillingness to remember what God has done. I love that David opened up this Psalm by just praising the Lord. I love that he said he says – Father, we can never praise you enough, and then he goes on to praise the Lord. He enters into God’s course with praise and then he remembers what God has done for him. And then he confesses his sin to the Lord. He says – Father like our ancestors like the men and women who’ve gone before us we’ve sinned. He’s asking for God’s forgiveness. He says you know – we’ve forgotten to be impressed by the things that You’ve done. We’ve forgotten Your acts of kindness to us and instead, we rebelled against You. And even in the face of our rebellion, You saved us anyway. Why? Because He wants to defend the honor of His name. He wants to demonstrate His mighty power. Men and women, He wants to do that in your life right now. He wants to do that in your life. He wants to do it in my life. He wants to do in the lives of our children. He wants to bless our children – not for the sake of just bless them alone – but so that He would be glorified! So that we wouldn’t forget, so we could tell everyone around us – look what God has done! Look what God has done. I was privileged earlier this week to send a package of of Becoming MomStrong books to a group of ladies who have a MomStrong Bible study and they live in Paradise, California. And eight of these women lost their homes, lost everything they had. As I was writing my name and just trying to encourage them – into each of the covers of the book – the Lord so impressed upon me that He wants to get the glory in every situation in our life. He wants to get the glory in the wilderness. He wants to get the glory in the high places and the low places and that’s where God works. So if you’re in the middle of a test right now, hang in there because a testimony is coming. If you don’t forget the goodness of the Lord, don’t forget who you serve, don’t forget that you’re just passing through, don’t forget that this world is not your home. Don’t forget that your primary responsibility as a mom and as a dad who loves Jesus – is to train your children in righteousness. And so often I think the plague that God sends. It is a consequence of our own, of our own sin. Which that’s like the B word in our home. Like when our kids say that they’re bored I’m like – Oh really? because I got a bathroom. B is for board and bathroom and now you get to go clean it! you gave us what we asked for because now we’re not bored anymore. But you sent a plague along with it which is this thing that we didn’t want to do and now we’re doing because we complained. And it’s kind of the same way. I had to laugh when she said that. I was like – yeah, it’s kind of the same way. I have a friend who says that God wouldn’t need to do anything except for abandoned us, except for to remove His hand – for us to suffer the consequences of our own unwillingness to remember the faithfulness of God and to walk in right relationship with Him. And so as we come into the Christmas season I just want to encourage you – keep your eyes on the Lord this season. Don’t worry so much about spending all that money on Christmas gifts. We’re gonna talk about this next week on the podcast. I just want to encourage you spend your time and your resources in the things that God wants you to invest in. You know every year I have a battle with the mice. You guys have heard me say this and this last Christmas – again, I pulled my stuff out just a couple of days ago and the mice had gotten into containers that I thought were closed. And every year I throw things away. Every year! Every year I throw away heirlooms. This year I had to get rid of a Christmas tree and my husband and I were like – should we buy a Christmas tree? Well of course they’re they’re expensive right now because HELLO – it’s Christmas time – supply in demand. So we made the decision not to do that. But it seemed ridiculous – we were like – Lord, what do you want us to do? And I knew in my spirit immediately – DON’T DO IT. Like my flesh is like DO IT DO IT DO IT – spend the money that you don’t have, on the thing you don’t need, that you’re only used for three weeks and you could probably buy cheaper after Christmas. But my flesh wants to do it! And God is saying take every little thing before me and I’ll help you. My word is and lamp to your feet and a light to your path. Don’t forget that you serve a mighty God and he loves you. He wants to be invited to every aspect of your life. I’m going to come back on Friday with my friend Ann Dunagan. Many of you guys have heard by now the story of Jonathan Chow – he was a a young person from my neck of the woods here in Vancouver, Washington that went to a sentinel tribe and was killed for his faith trying to witness those people. I’ve heard a lot of back and forth about it. It’s a very compelling story and a great reminder to us about God being at work in the lives of His children and what it looks like to listen to and follow the Lord. So I hope you guys will come back to listen to Ann Dunagan and her interview with me this Friday. In the meantime, this is a great great great time to sign up for Momstrong International. 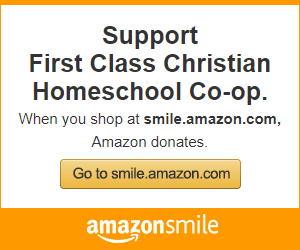 It’s also a fantastic way for you to support the ministry here at Momstrong International. If you are encouraged by what we’re doing here at the podcast, this is a commercial free podcast as you guys have noticed, and so we’re not bring in money in doing this. We’re trying to encourage you to walk in right relationship with the Lord and raise a families that are strong in their faith and strong in their walk with God. If you would if you’re interested in supporting this ministry the non-profit organization is called Firmly Planted Family and we love to hear from you. Many of you been writing to us lately! Wwe read every letter! We are thankful and pray over every gift that comes in. You can write to us here at 11100 NE 34th Circle Vancouver, Washington 98682. If you’d like to reach out to us please to shoot us an email podcast@thebusymom.com. I hope you guys have a blessed end of your November I can’t even believe we’re so close to the end! It’s just gone by so fast and I want to just encourage you don’t forget what the Lord has done. Walk in right relationship, praise Him every chance you get, seek Him in every situation in your life, turn the hearts of your children toward their Heavenly Father. And then wait and see what God will do. Good things are coming! Have a great day everybody and I’ll see you back here, on Friday!